On October 15th & 16th, the Helena Youth Soccer Association (HYSA) hosted the 5th annual Sleeping Giant Soccer Classic Tournament. Our tournament concludes Montana's fall season of competitive club soccer. 87 club teams from across Montana participated in competitive matches with players ranging in age from 9 years old to 15 years old. Over 2,000 players competed in three Helena area field venues for Championships. 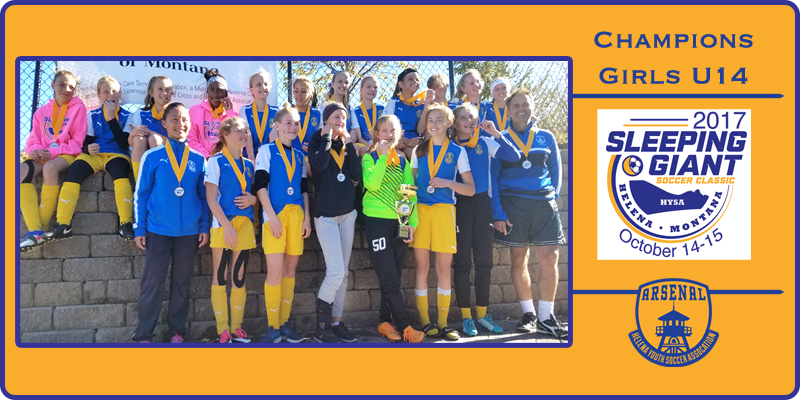 The Helena Arsenal U14 Girls, coached by Michele Zentz and Joe Vranka and managed by Samantha Mongoven, defeated four teams while advancing through the playoffs to take the Championship Title. In total, the Arsenal girls outscored their opponents 18-2. In the first game Helena beat Bozeman Blizz White 3-0 with goals scored by Lillian Danzer, Emerson Grafton, and Charli Grafton. Goalies were Payton Mongoven, Emma Wilson, and Jaelyn Dwyer. The second game was against Great Falls MT Rush. The girls won with a score of 2-0 on goals by McCoy Vranka and then on a cross by Odessa Zentz to Lillian Danzer. On Championship Sunday the girls began the day by defeating Whitefish Flathead Rapids 3-1. Payton Mongoven continued her unbeaten streak as goalkeeper, aided by goals from Brogan Vranka, Danzer, and Emerson Grafton. Game 4 was against Kalispell Flathead Force. Brogan Vranka kept up her exceptional weekend of scoring with 3 goals, Emma Wilson scored twice and Elsa Grebenc added another. Goalkeeping was shared by Charli Grafton, Camryn Mosness, Kaiya Newby, and Lillian Danzer. The final score was 6-0. The Championship game was against Great Falls MT Rush and once again Arsenal had a strong defense and abundant scoring with Payton Mongoven making several saves as goalkeeper. Emerson Grafton had a hat trick, and Lillian Danzer scored again off an assist by McCoy Vranka. The final was 4-1. Additional offensive power was provided by Riley Walsh, as well as bench support from the injured Hannah Martin.